Enjoy escaping from the hustle and bustle while enjoying many modern amenities. Baldy`s Nest is a modern 3 bedroom, 2 bathroom cabin located on the picturesque Gunflint Trail. While not directly on Gunflint Lake, you have great lake views and easy access from the public boat launch. The property is filled with trees, flowers, and an abundance of wildlife in the summer months. The open living area features a living room with a gas fireplace. Comfortable seating provides a place to kick your feet up after a long day of exploring the Gunflint Trail. The flat screen TV and Blu Ray player provide what little digital entertainment you will find in this home- otherwise you can unplug and unwind. 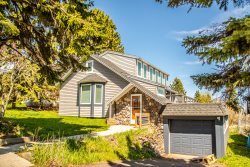 Enjoy views of Gunflint Lake through the sliding glass doors that lead out to the lake-facing deck. The kitchen is well-equipped for preparing meals during your stay. You will love the granite countertops and stainless steel appliances in the kitchen. This open kitchen also has a dishwasher- no need to hand wash dishes during your vacation. The open layout allows you to be preparing a meal in the kitchen while still interacting with friends and family in the living room. There is seating for six at the dining table. The vaulted ceilings give this room a spacious, open feel, while the oversized furniture and gas fireplace make it cozy and inviting. The master bedroom has a king bed and views of Gunflint Lake. The master bedroom also has an attached full bathroom and walk-in closet. The attached master bathroom has a shower/tub combo. The first guest bedroom has a queen bed. The two guest bedrooms are located down one hallway, separated from the master bedroom by the living area. The second guest bedroom has a twin over full bunk bed. This child-friendly room is great for kids. The guest bathroom has a shower/tub combo. The Glunflint Lake-facing deck is a great place to enjoy a cup of coffee in the morning. Grill up some food on the gas grill while enjoying the exquisite views. Sit back, relax, and enjoy the sounds of nature on the deck. Baldy`s Nest is the ideal getaway in the beautiful North Woods. Enjoy nature at it`s best on the Gunflint Trail. Baldy`s Nest sits on a large lot with no visible neighbors, nothing but peace and privacy. Just a short walk from Gunflint Lake. Pull into the driveway, unpack, and unwind. The view of Baldy`s Nest as you pull up in the driveway. When you see this, you`ll know you`re home. If you are looking to escape from it all in a remote wilderness setting, but don't want to sacrifice modern amenities, look no further than Baldy's Nest. This log sided cabin is located near the end of the Gunflint Trail, roughly an hour from Grand Marais, but offers a modern feel with granite countertops and stainless steel appliances in the kitchen, a gas fireplace and flat screen TV in the living room, and large, comfortable bedrooms. Baldy's Nest features 3-bedrooms and 2-bathrooms on a single easy-access level. The master bedroom has an attached bathroom and a spacious deck spans the entire length of the living room. While not directly on a lake, Baldy's Nest provides sweeping 180-degree views of Gunflint Lake, which acts as a border between the United States and Canada. There is a public access point less than a mile away so you can bring your canoe, kayak, or motorboat and enjoy a day on Gunflint Lake or many of the other nearby lakes. At the end of the day, you can come home to Baldy's Nest and relax in the spacious open living area or rest your head in one of the comfortable bedrooms. Passing through the town of Grand Marais, MN you will find the entrance to the Gunflint Trail Scenic Byway marked by a statue of a voyageur and his canoe and a black bear. Take this remote wilderness road up to South Gunflint Lake (follow signs to Gunflint Lodge). Along the way, you are certain to spot many wildlife creatures. These can include deer, bear, fox, wolf, and even moose! In the springtime, many Gunflint Trail visitors have reported seeing mother moose with their calves, a sight that is becoming more rare all over the world. Once at Baldy's Nest you are in your own most peaceful spot on earth, with plenty of wilderness activities to keep you busy during your stay. Enjoy hiking, canoeing, and exploring this beautiful area. Take a day trip into the BWCA or hop over to the Gunflint Lodge for a bite to eat. Head down the trail into the quiet, peaceful town of Grand Marais for a day of shopping and dining at the many restaurants that make this quaint town so unique. Whether you are coming for an adventure or coming to relax and escape from it all, Baldy's Nest is here to be your Gunflint Trail home away from home. Gunflint Lake Note: Since Gunflint Lake is located on the US/Canada border, and there is no customs station, you will need to obtain a Remote Area Border Crossing Permit (RABC or CANN Pass) to cross the border for any recreational purpose, including fishing. You can apply online at http://www.ontario.ca/page/fishing-licence-non-residents-canada. It takes 4-6 weeks to receive, so plan ahead! You will also need to have your passport with you while in Canadian waters. Winter Travel Note:Baldy's Nest is located in a beautiful but remote wilderness area, an area that receives heavy snowfall in the winter. Wintertime rentals require a 4-wheel drive vehicle. Please do not book this property for the winter months (November-April) if you do not have access to a 4-wheel drive vehicle. The location of Baldy's Nest is breathtaking, and the interior fantastic. This rental really felt like a home away from home. Clean, modern yet classic log structure. The kitchen was a dream to work in. The beds wonderfully comfortable. Everything you need for a relaxing get away. We loved it.